Currently, we have chosen to home school part-time. We also use our dining room as our home school room. This means at one time I had school materials scattered throughout the living room, dining room, and my room. 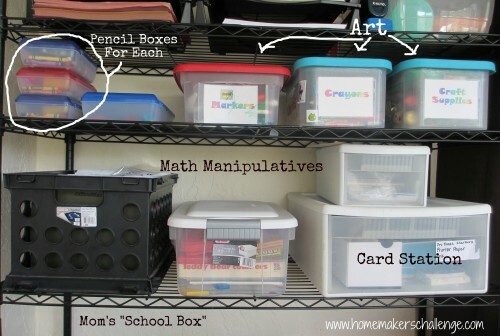 I spent a lot of time collecting and re-stacking and putting away and getting out as we began and ended our homeschool days. And my boys had a lot of down time during which they liked to draw on each other (and their little siblings), beat on each other (and their little siblings), run away from the home school area and generally get distracted. Then my husband had an extra shelf left over from organizing his business and offered it to me. The skies parted and angels sang. We attached shower curtain hooks and a shower curtain so that when it gets unruly (which is <almost> never) I can just slide the curtain across. Voila! Whether or not you have a shelf that looks exactly like this, it’s not tough to find something on craigslist or at a garage sale that will work. 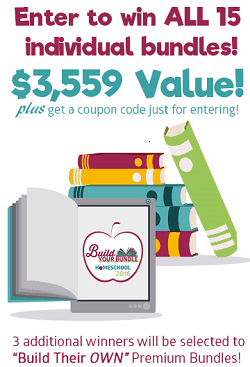 I’ve customized what we have on the shelves, and will give you a play-by-play of our “Home School Room”. 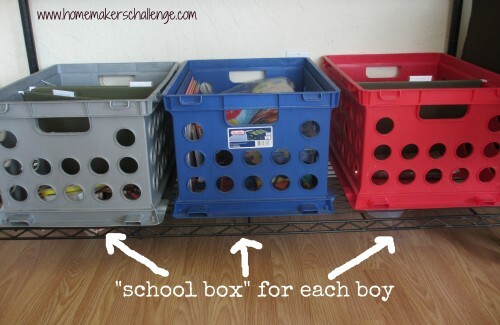 Each boy at our house has his own “school box”. I have arranged subjects by file folders and fill them with each days school work. It’s a modified version of the work box system – and you can find more about it at The Homeschool Classroom. You’ll see my “school box” pictured above. Once the boys finish a folder, they slide it into my box. Then when their box is empty, they know they’re done with school for the day! Each boy also has their own pencil box with crayons, sharpened pencils, markers, etc. Ideally, these would be kept in their school boxes, but we have an almost two year old who likes to draw on walls and floors and tables – so we keep those pencil boxes up high. I also created a “card station” that I’m pretty happy with. We make a lot of cards for friends and family and before there was a lot of hunting around and rummaging for the stickers, the markers, the stamps, etc. No longer! 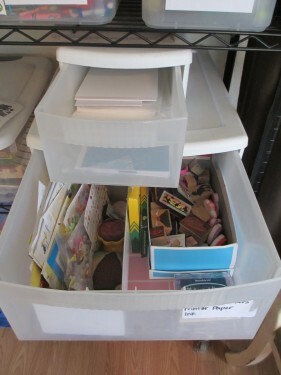 In the large box are stamps, markers, stamp pads and stickers. Now I can just tell my boys to make the cards and they know exactly where to go. The top shelves are mostly art/fun shelves. I have our Bible books up high, all in one spot so that every morning it’s easy to locate them. 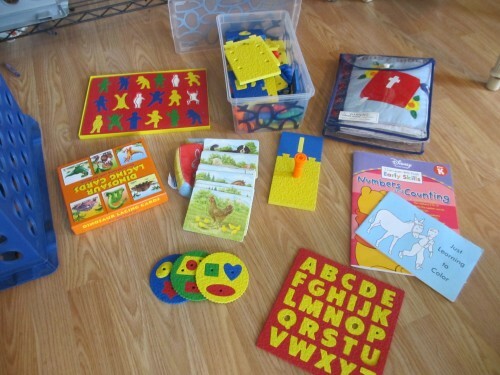 My pre-school son has a box too, and I thought you might be interested in what we use for him. Rod & Staff workbooks for 3-4 year olds. They also have a sweet beginner’s coloring book “Just Learning To Color” for just a few dollars $1.25! a “Busy Bible” that I envied at a homeschool conference one year and finally was able to buy the next. It is so fun. fun Lauri toys that can be found at My Father’s World. *I am not an affiliate for these companies! I just love these products! « Who needs a room for school? so the next article; how to afford all those bins and stuff! thats my issue. 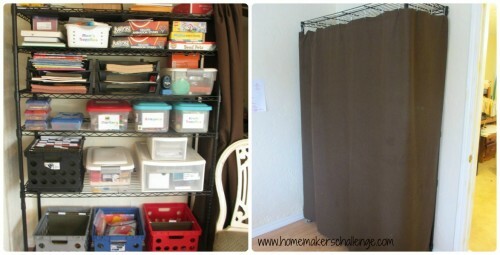 i know HOW to organize, i just dont have the money to do it! Ericka, I know the feeling! I actually found the drawers at Goodwill and my boys had gotten several of the boxes filled with art supplies as gifts. 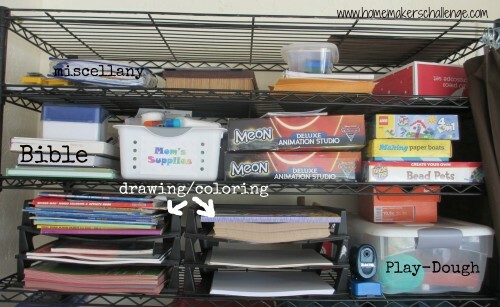 Once the art supplies were gone I re-used them for this shelf system. Some of the boxes were also used to store toys and when I purged I had them left over. Sometimes looking around the house and brainstorming, I’m surprised at what I can come up with. I have found cheap organizers at Walmart. The large boxes on the bottom shelf are actually on sale for back -to-school right now for $3.97, and the colors they have are a good variety!